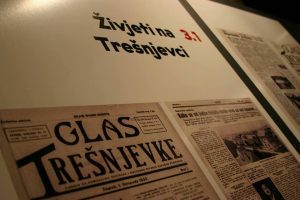 CeKaTe Theatre and DLAN NGO proudly present the first international Theatre Festival “Sign and Sound” (TFSS) which will be held on 27th and 28th of September 2018 in the CeKaTe Theatre Hall (Trešnjevka Cultural Centre, Park Stara Trešnjevka 1, Zagreb; Croatia). It is the first inclusive festival dedicated to the development of mixed deaf and hearing audience, and to the promotion of bilingual performances and deaf arts. 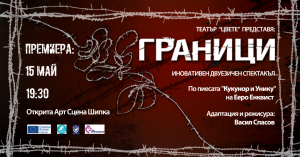 The Festival will be opened on 27th September 2018 at 18.30h by a bilingual theatre play “Guardians of Dreams” performed simultaneously in sign and voice Croatian language by deaf and hearing actors and actresses from DLAN NGO (Kristijan Ugrina, Iva Vrbos, Korana Ugrina and Lino Ujčić Matessa), directed by the president of DLAN NGO and of TFSS, Mr Angel Naumovski. Is it possible to establish contact with another human being despite the constraints? What does it really mean to be inclusive? Can the deaf and the enemies become lovers? The performance will be presented on the 20th and 21st of October 2018, at 9:30 pm and 5:00 pm, respectively, at Teatro do Bairro in Lisbon. This is the battlefield of a war of contradictory feelings, of confrontations with reality lived and dreamed, where they protect a space that, after all, who does it belong to? What keeps them here is exactly the will to communicate, to listen and to kill what separates them. 3,50 x 2,70 [three and a half two seventy] tries to question the space of the other, the borders, from the inside out, from the outside to the inside, in a search of a common language where silence, words and gestures don’t belong to no one. 3,50 x 2,70 [three and a half two seventy] is a creation of Ana Rita Barata and Bruno Rodrigues./ CiM – Dance Company, interpreted by six deaf actors and listeners. It’s an adaptation of the original piece of Eero Enqvist kukunor (with original title in Finnish kukunor ja unikuu or kukunor and unikuu adapted to English as “Guardians of Dreams”), within the European project Sign+Sound Theatre (Creative Europe Programme – European Commission).This project’s main objective is to promote the Deaf Theatre at European level and, in particular, the pioneering method of IBT (Innovative Bilingual Theater). This method explores new ways of creating inclusive art for an inclusive audience, allowing artists and spectators, deaf and hearing, to enjoy both the same and simultaneous artistic experience. 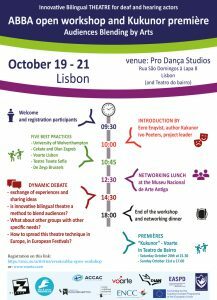 Sign and Sound Theater Europe (2017-2019) consists of a group of 9 partners from 6 European countries – Belgium, Brussels, Bulgaria, Croatia, Portugal and the United Kingdom.